The Twins play their first game on Monday, so it’s time to wrap up our Twins rotation preview. On Thursday, it was announced that Adalberto Mejia will be the team’s fifth starter coming out of camp. Mejia is an exciting young prospect, but he has only pitched 2.1 innings of Major League ball. That’s not a lot of available PITCHf/x data. Rather than subjecting you to a deep dive into each of his 41 pitches for the Twins last year, we’re going a different route for our last preview. Tyler Duffey and Jose Berrios were in the running for the fifth starter spot, and have more substantial PITCHf/x history to draw from. Both will almost certainly make an impact for the Twins at some point this year, whether from the pen or the rotation. Today, we’re delivering two mini examinations of each pitcher’s mix of pitches. Duffey relies heavily on his curveball, throwing it roughly 40% of the time. The other 60% is split between his four-seam and two-seam fastballs, as well as a changeup which he throws primarily to lefties. He throws his curveball more often when he’s ahead in counts than behind. Because of this predictivity by count, his PCPS of 0.095 places him 43rd out of 152 qualified starters in 2016. 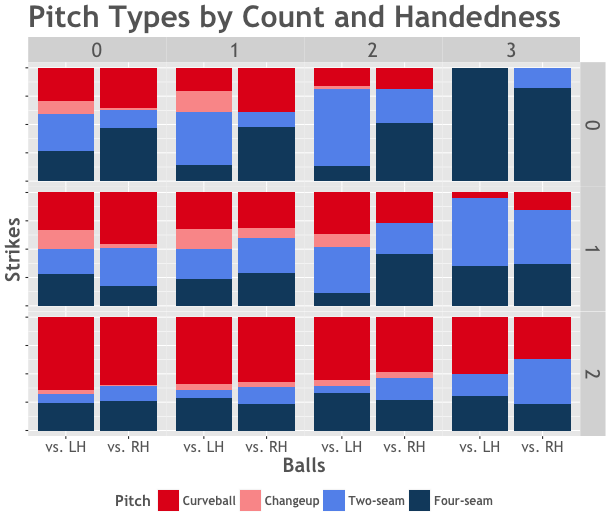 The plot below shows how Duffey’s pitch selection varies by count and hitter. He relies heavily on his curveball in nearly all counts, but especially when he’s ahead. In 0-2, 1-2, and 2-2 counts, he throws his curveball more often than not to both lefties and righties. He throws both his two-seamer and changeup more often to lefties, as both pitches tail away from left-handed batters. Duffey falls into pretty clear patterns when he’s ahead in the count. When he’s up either 0-2 or 1-2, he’ll throw a curveball down 55% of the time, and a fastball up 30% of the time. As the chart below shows, this holds for both lefties and righties. Note also that he has a slight tendency to throw his high fastballs to the outer part of the plate. If you’re watching Duffey this season, keep an eye out for lots of curveballs, especially when he’s ahead in the count. His transition to a bullpen role could allow him to lean even more on his curve; his reliance on a single offspeed pitch might play better in a relief stint than a six- or seven-inning start. Jose Berrios throws the same pitches as Duffey: two fastballs, a changeup, and a curveball. 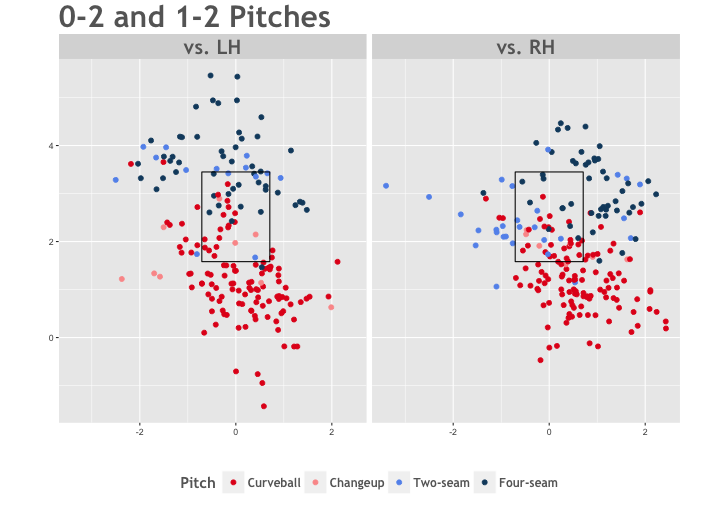 However, he throws his offspeed less than Duffey, and his preferred offspeed pitch varies by batter handedness: lefties see more changeups, while righties see more curveballs. Before digging too deeply into the data, it should be noted that Berrios has less data to draw from than some pitchers, as he was only in the majors for two relatively short stints in 2016. This data also doesn’t show Berrios at his best1 because he struggled in the majors. 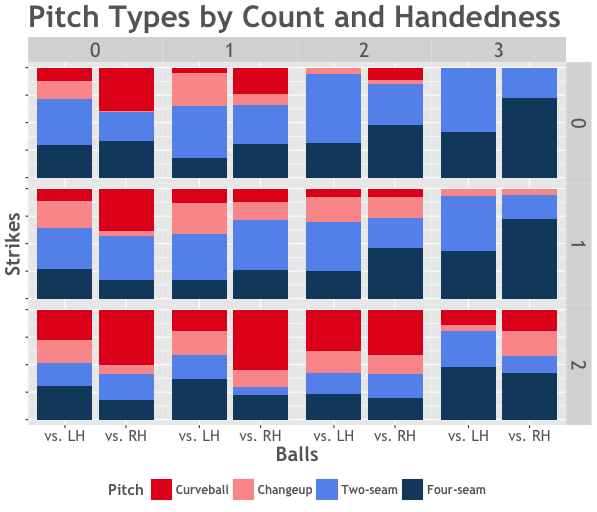 With that out of the way, let’s again start with a plot showing pitch selection by count and handedness. Early counts are marked by lots of two-seamers and changeups. In later counts, when he’s ahead, he throws more curveballs. One interesting note about Berrios: he threw more two-seamers in his second stint in the majors than his first. The pattern looks clear, though it’s hard to tell whether it truly shows a new approach, or whether it’s noise. It’s worth watching whether he continues to throw his two-seamer more often in 2017. Ultimately, if and when Twins fans see Berrios in the majors, the focus will be not on his pitch mixing strategy, but simply on results. Much of the team’s future hinges on finding a couple of reliable starting pitchers. Berrios has shown flashes indicating he could fit the bill, but has also struggled mightily thus far in the big leagues. His curveball, changeup, and fastball are all great pitches, and mixing them effectively could be the key to a successful career.